Thank you so much for volunteering your time, treasure and talents. Your offering is an investment and will help strengthen young women and their sponsors in identity, confidence, self-esteem and character. Thank you for being a part and making this a successful investment in spreading God's message in NWA and beyond. We are excited to have you join us in supporting this community based, regional retreat. 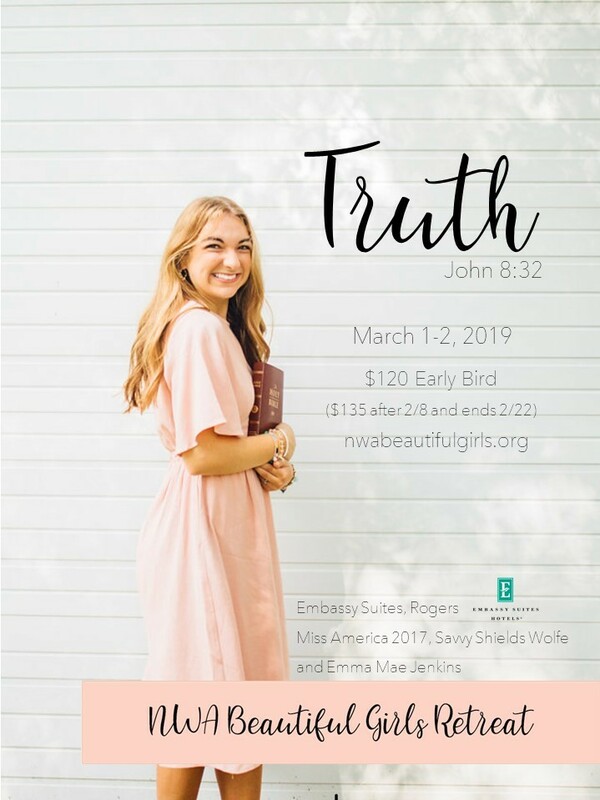 If you have questions, please contact us at nwabeautifulgirlsretreat@gmail.com or check the FAQs link. Please arrive 30 minutes prior to your scheduled volunteer time and register at the Kiosk by the Pinnacle Ballroom. There you will receive direction and your NWA Beautiful Girls Retreat bracelet! PLEASE NOTE: Registerting as a volunteer does not guarantee or place you in a room or allow you food privileges. There is, however, food available at the Ceadar Creek Bistro as well as some snacks and waters at select times during the retreat in other rooms. If you would like to be a retreat participant, please sign up additionally as an individual or in the multiple participant sign up so we can place you in a room and be included in the food and other activities. Each participant's ticket will be $120 until February 8 (and $135 after February 8 through February 22). Meals will be available for purchase at the Embassy Cedar Creek Bistro. For any questions, please contact us at nwabeautifulgirlsretreat@gmail.com.